Ooooh I love these Kimono dress. Hiper stylish! Have a lovely day, dearest Erika! I love the VS one!! Cute dress. I love the VS version! especially the color! I LLOOOOOOOVVVVE this! I have been looking for a kimono dress forever and I never thought to look at VS. I love theirs so much more because of the length. And price. Yes! i love love love this! i got my victoria's secret catalog in the mail this past week. i love their clothes! so cute! actually, I think the VS one is much prettier. Neither looks like something I'd really wear, but I do like the color and price of the Victoria's Secret one more than the Issa one. i actually think the vs one looks better, so i'd be frugal today.. I really love the VS one! Even more than the expensive one. OMG darling what an exquisite find! I find Victoria Secret to have what I want. Cool dress! I love the VS one more! So chic, and what a fab color! I love the VS. I've always liked kimono shirts and dresses. I adore these. I definitely need a kimono now! 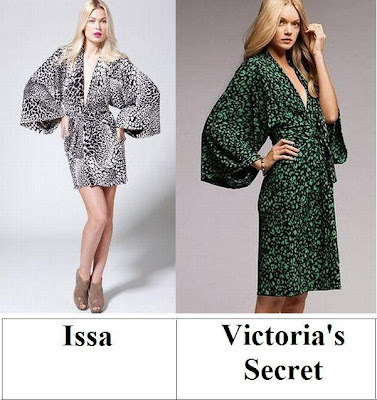 I love the Issa one! VS for me, but I'd like to see either dress with a really fitted long sleeve rather than this bell sleeve. They're both beautiful, but the bell takes away from the wrap, somehow. Erika,I have a challenge for you on my blog.Check it if you want to! Oooh. I love the Issa...it's absolutely gorgeous! hi love. long time no visit. im sorry for that. but ive been so occupied. hope youve been having a great time! i LOVE the VS dress. its so divine. Oh i just love the one on the left. What a wonderful statement frock! I prefer the VS one like your other readers! The green colour really pops and adds a touch of elegance to the dress. Thrifty for sure! I love the green color of the VS one! nice dress. love the style. I like VS way better! I like VS one better. love this feature that you do...so true that you can find similar items from designer in regular stores! I am giving away a Zagat guide to NYC nightlife at the moment..don't forget to stop by!! Have a wonderful weekend!! I love the kimono look. Such a dramatic silhouette that works pretty much anywhere, I think. I will have to go with Victoria's Secret! VS all the way!! Though I don't imagine I'd be able to pull this off as out of the house wear. Though, if circumstances are correct, that isn't a bad thing. I like the Victoria Secret much more! This is a toughie, Erika, because the Victoria Secret's version is VERY pretty and an exceptionally good price, but I ALWAYS dreamt of an 100% silk Issa dress - so I guess it's keep on saving for me. I don't think my petite self could pull this off, but the Victoria's Secret one is such a pretty shade of green! Love them both, but as always, the less expensive one is my pick! I'm a fan of the green print of the VS dress way more too. Frugal femme fatale for me! i actually prefer the VS one! love it! I LOVE LOVE LOVE the VS number. The color is super fab! I love these kimono dresses... but I think I prefer the VS one. I love the green color... I actually made a kimono once... I should dig it up and sport it around town.. LOL.. it would be quite interesting to see people's reaction. Happy Friday Erika! I have been looking all over for the perfect Kimono dress. I have been wanting to buy one for a while, but just haven't found one that caught my attention. I do like the style of the VS dress, but not loving the colors. Thanks for the post. i LOVE them both! the sleeves are so pretty! I adore the VS dress! Why can't I just have both? Ok, VS it is, I love the color!